When you are getting sunglasses for your mom as a gift, while sticking to classic designs as much as possible, you don’t need to be extreme. Sunglasses will look good only when they are updated, current and new in all regards. Of course brand image will play a key role in this. Certain brand names are geared more toward teenagers, such as Marc Jacobs or Ray Ban. Others, more towards mature people. Tiffany is perfect for mature women. Every single pair will be appropriate for your mom. If you see something on the shelf and feel very strongly about it, go for it. In the end it is gift from you for your beloved mom. If you are strongly opinionated and believe your mom needs a pair of aviators, no problem. Or perhaps she is ready for a pair of butterfly shaped sunglasses just trust yourself and get her this. Tiffany ensured that even aviators are classy, elegant and chic. In today’s material world packaging often becomes as important and it’s content. The moment of unwrapping a gift is quite indulging and pleasurefull. But Tiffany took packaging a step further. Their blue box is a true icon. There were countless movies made showing Tiffany blue box with white ribbon. 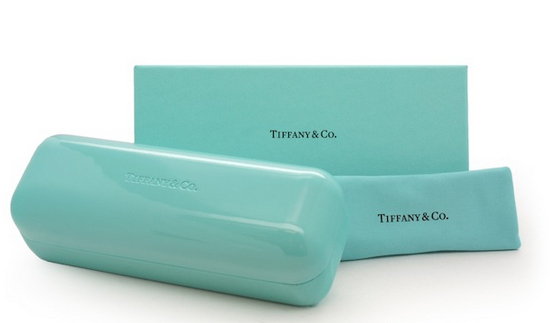 Believe it or not, Tiffany sunglasses packaging is just as awesome as engagement rings. It also has a blue box, shiny blue hard case and silky blue cotton cloth. Packaging alone is worth getting Tiffany’s for a gift.